The great family of the “Lanterna” and “Lanternina”, that is to say equilibrium achieved by enclosing light inside a casing made of air, is completed by a lamp made of five bulbs, three bulbs or a single bulb to be repeated in series. Its pure shape, by now considered a classic, enables a typology that seemed to be irretrievably linked to the past to be brought up again confidently. Suspension lamp giving diffused light. 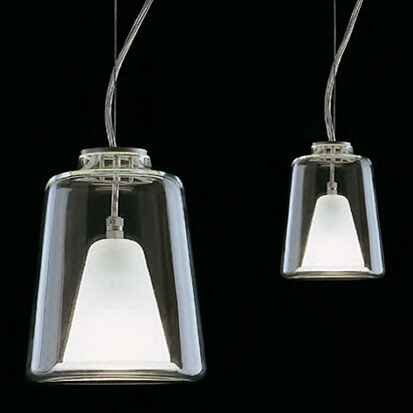 Transparent and sand-blasted Murano glass diffusers. Glazed anodized metal structure.